The sporting world is one of ongoing evolution, constant innovation and is an area in which boundaries are always being pushed, but with all of this continuing transformation comes potential problems. As we introduce new methods and technologies to analyse players, we also introduce new data to try and obtain actionable insight from. In an ever expanding world of sport science and data analysis we need to ensure we have the tools that can help us not only look at our players from a holistic viewpoint but we also need to discover insights as quick as possible to make evidence-based decisions. This is where Alteryx is currently benefiting sports clubs, by enabling them to combine data from all of their data sources (GPS, Opta, Tracab, Prozone, Hydration Testing, Wellness Surveys) to enable the clubs to discover deeper insights and have a greater impact on player performance, fatigue management and injury prevention. The predictive and spatial tools available in Alteryx lend themselves beautifully to sport. 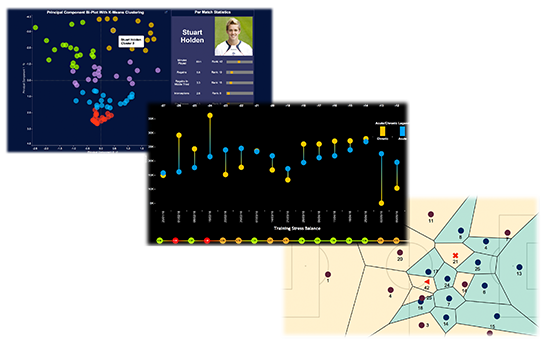 So whether you are looking to identify key injury triggers, predict training loads or carry out spatial analysis of a player’s movement – Alteryx has everything you need. Download your free trial of Alteryx and also download the sample workflows that are designed to aid in real-world scenarios. These workflows include working examples and guides to downloading data from sports websites, creating club-specific match performance metrics, analysing player tracking data and creating meaningful z-scores from your GPS data.